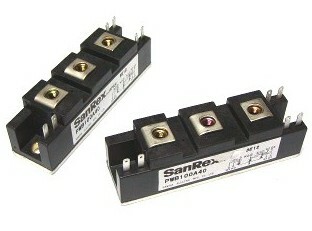 A&S provides all types of SanRex Thyristors like Anti-Parallel Thyristors, Dual Thyristors. Our product-range is listed as following: bidirectional thyristor, reverse conducting thyristor, Gate Turn-Off Thyristor(GTO), Gate-Commutated Thyristor(GCT), phase thyristor, distributed gate thyristor, Integrated Gate-Commutated Thyristor(IGCT), pulse thyristor, HVDC thyristor, fast switching thyristor, Plastic silicon controlled Ceramic package thyristor, Metal silicon controlled thyristor, high-power thyristor, medium voltage thyristor, low-power thyristor etc. We are pleasured that we can provide following international brands for industry over the world: IXYS, Infineon, ABB, Semikron, Mitsubishi, Powerex, AEG, Vishay, GE, Westinghouse, Toshiba, etc.